It’s that time of year again, my friends! Though for many of you this may be the first. It’s Ren. Faire season once again in Western PA and, as usual, my husband and I have made the trek out to the Pittsburgh Renaissance Festival for a Saturday of medieval themed fun. It is always an adventure at the Ren. Faire, though we seem to be getting better at them as the years go on. This year was pretty tame, but lovely nonetheless. My first year at the Ren. Faire found took me the long way around. My friends and I ended up going the wrong way to begin with and ended up in Ohio. From there we had to try desperately to get ourselves turned around and find the our way back. We managed it, after like 200 miles of driving or something like that. It was an adventure to top all others. In years following we would generally get lost at least once on the way there or back, often due to poor navigators. We have a GPS now and that helps a lot. We also live like an hour closer, so that also helps. This year we managed to get there and back and only had to turn around once. This year was a wet, cool kind of trip. It was supposed to rain all day, but we got lucky and the sun even came out a little towards the end. I would much rather a cold day for Ren. Fairing than a hot one. Dressing up for the Ren. Faire generally requires a lot of layers and it’s much easier to add layers to keep warm than it is to try and rearrange your costume to keep cool. This year I had four layers, adding a corset to my collection of mismatched articles that come together to form my Ren. Faire outfit. I think I should have laced it a bit tighter, though. It kept shifting to the side, which is a bit awkward looking. I learned my lesson from Tekko, though, and didn’t put it on before we drove down. 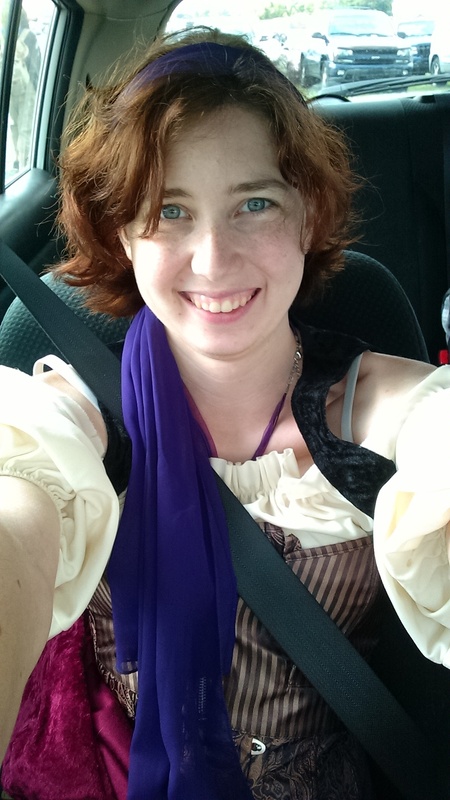 Driving in a corset is the least fun. So, it was a little rainy this year and a little muddy, but that didn’t stop most of the fun. The horses were still out for the joust, which surprised me a little. It looked rather muddy in the arena, but apparently not muddy enough to keep the horses in. We only watched on of the shows this year, having seen most of them every year we’ve come in the past and being very familiar with the formula they follow, one is enough to satisfy. It was particularly good this year, though. They seemed to be having a lot more fun with it than usual. Of course the joust is only one part of the entertainment. This year we also enjoyed Cast in Bronze, as usual, the Duelists, who couldn’t actually duel due to a slippery stage, and Klass Klown, a juggling, fire-breathing acrobat. And, of course, there’s always the awkward show. Last year it was some rather raunchy singers by the Pirate’s Pub. The shows are generally supposed to be family friendly, meaning clean language at least, but anything that’ll go over a kid’s head is allowed. It’s amazing how much can be implied in a song about birds. This year was it was Flourish, who wasn’t so much inappropriate as just not very good. Another juggling acrobat with fire, but where as Klass Klown has a charismatic character and knows how to get a crowd into his show, Flourish waved a flaming scythe around a little and gave the audience some simple cues to follow and awkwardly tried really hard to get a kid to cooperate. We sat and watched for maybe twenty minutes or so and all she did was a couple ring tricks, some uneventful balancing and pulled some guys from the audience at which point Logan decided it was time to move on. I didn’t buy anything new this year, which is sad. I did get some nuts, though, which is a happy thing. I have this unreasonable love of cinnamon roasted almonds and a new found love of cinnamon roasted pecans. Pecans are my favorites of all the nuts. Seriously, they’re delicious. As soon as we walked into the Faire I could smell the Royal Nuts booth and I knew they must be mine. My husband got his annual jar of honey, which is probably the part he most looks forward to about the Ren. Faire. I really wanted to replace my butterfly ring, but I could find anything that I liked as much as my butterfly that wasn’t pointy. Apparently I just really like pointy things. I did find a puzzle ring that is super cool and I really want one now, but we didn’t have enough money budgeted to buy one, so I left without it. Sad day indeed, but I think I’ve found one that I can get online which is pretty much the same and a little cheaper and will probably be my Christmas gift. So that was this years Ren. Faire adventure. We went with some guys from our D&D group and my brother and ran into some college friends who happened to be there on the same day, which is always a lovely thing. We didn’t get lost and afterward I got chicken and dumplings, I’d call that a successful trip. Despite the wet it was a good day. Maybe next year we’ll make it for the pirate’s weekend.